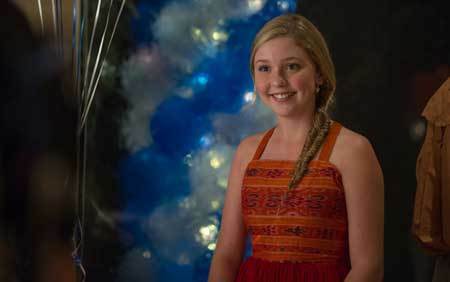 In Dolphin Tale, Hazel Haskett, played by then tween actress Cozi Zuehlsdorff, was struggling for her own identity at Clearwater Marine Aquarium, the rescue and rehab facility for marine life, that her dad Clay (played by Harry Connick Jr.) ran. 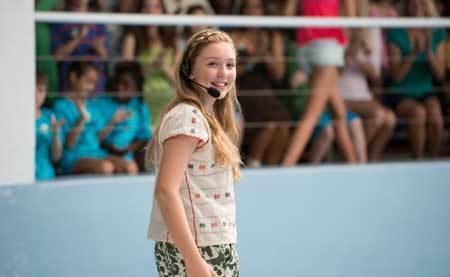 In Dolphin Tale 2, teen Hazel, like Cozi, is way more grown up and confident working as a videographer/documentarian at the aquarium. She also assists with animal medical care and announces some of dolphin Winter’s “shows” for aquarium visitors. 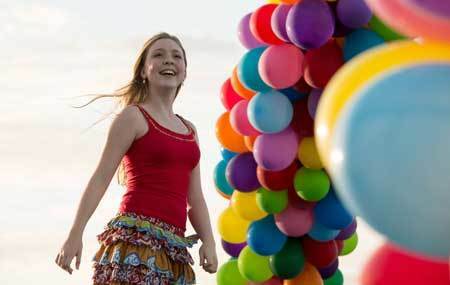 When her crush Sawyer (Nathan Gamble) gets an amazing chance to spend a semester at sea, Hazel is naturally at bit jealous but wants the best for him. She isn’t too sure about a young aquarium volunteer who seems to be flirting a lot with him. Kidzworld: Can you talk about Hazel’s new “job” as a documentarian in the film? She’s shooting much of the action around her. Are you into that or was this the first time you had used that kind of camera? Cozi: Oh no. I’ve always loved making (my own) movies. From my earliest memories, my friends would come over and I’m like “Let’s make a movie”. I’d pretend my American Girl dolls were saving the world and shoot that. At a bon voyage party for Sawyer Courtesy of Warner Bros.
Kidzworld: What did you learn from Winter that affects you now? Cozi: Through Winter we’ve met so many beautiful children, army veterans, wounded warriors, just incredible people going through all of life’s challenges. That is something that everyone on this earth has in common. We’ve all had something hard happen to us. It’s just incredible to watch these children. I’ve never met a kid who has been inspired by Winter with a bad attitude. They’re all going through something harder than I’ve ever dealt with and they all have a better attitude than I could ever hope to have. Hazel (Cozi) with Sawyer as he tries to cheer Winter up Courtesy of Warner Bros.
Kidzworld: Can you talk about your music? You wrote and perform “Brave Souls”, a song that runs over the end credits. Cozi: Yeah, the song “Brave Souls” is very fitting because it goes out to those kids I was thinking about when I was singing. There is especially one who passed away two days after she met Winter while we were shooting. She died of leukemia. Her name was Zoey, so I think of her. My music career has always been a part of my life. Music was my first big thing. My first role was as Annie in “Annie” the musical. I have kind of an indie pop style and I love to write. So, hopefully, you’ll see an EP coming from me this Fall. I’m going to have a huge hand in writing it because that’s my favorite thing in the universe. Kidzworld: Very cool. 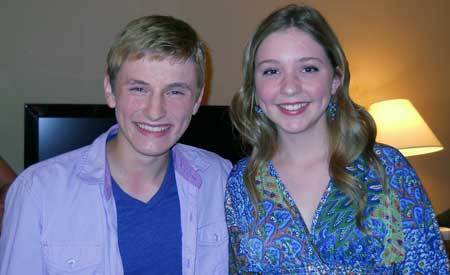 You are also now a spokesperson, along with Nathan Gamble for the Clearwater Marine Aquarium. Why is that work important to you? Cozi: The great work that they do there needs to be out in the media more. They rescue, rehabilitate then release marine animals. It’s so amazing to watch their work and bring attention to that, if we can, through our (she makes “air” quote marks) celebrity. Hazel (Cozi) announces a Winter show to the crowd Courtesy of Warner Bros.
Kidzworld: Where you there at the wrap party for the first movie when the trainers went out to rescue little Hope? Cozi: I can’t believe we were 12-year-old dummies. I think we (she and Nathan) just left and went to sleep. We missed beautiful Hope’s rescue but we did get to see her rehabilitation and that was an honor. Kidzworld: So, isn’t there a little spark of romance between Sawyer and Hazel in this movie? Cozi: (laughs) Well, we’ve grown up with our audience and we’re providing some excellent story material for children, teenagers and adults and because we wanted to provide something for the teens, we added a little element of possible romance. It’s innocent for the children but adds that little spark. Also, what’s so cute about the relationship is Hazel obviously likes Sawyer and he is totally oblivious. I can totally relate to all those girls out there, “Does he like me? What signals is he giving me?” She’s like “What was that volunteer’s name?” It’s cute. Hazel (Cozi) and Sawyer (Nathan Gamble) at the aquarium Courtesy of Warner Bros.
Kidzworld: So, is your career all mapped out? Are you considering things other than acting? Cozi: I’m going to college and possibly pursuing a job as an elementary school teacher. There are many things I’d like to do with my life. I want to leave my options open for the Lord to direct me wherever he wants me to go. I recognize with my really strong beliefs there may not be roles I can count on all the time in my life, so I’m definitely looking at other things I’m just as passionate about. Hazel, dad Clay and Dr. McCarthy try to help Winter Courtesy of Warner Bros.
Kidzworld: Your character Hazel is a wholesome, typical teen. How are your teen years going so far? Cozi: I told my mom I was always so frightened of becoming a teenager because I thought I would turn into The Hulk and have no control over myself, just turn into an evil person and not be able to control it. But, I’m not always crazy and angry. It’s cool to grow up and put something out there that hopefully will help teens. They aren’t listening to what we say, they’re watching what we do. Hazel has some conflict with her dad but she approaches him with respect. He’s listens to her with respect. It’s like “Dude, that is how we should treat our parents”. Hazel (Cozi) prepares a surprise for Sawyer Courtesy of Warner Bros.
Kidzworld: What is your most touching fan encounter so far? Cozi: There are so many. The most special ones are these kids so close to dying and I wouldn’t really call it fan encounters as much as a dream fulfilled for them. We’ve seen so many dreams fulfilled. One boy had a condition called Butterfly Skin, where your skin just comes off and you can do nothing about it. He was so excited to see Winter. It seems wrong to call that a fan encounter. They aren’t like “Sign my face with a Sharpie!” It means more to them. Kidzworld: What have you had to learn so far to keep going in the acting biz? Cozi: You feel immortal when you book your first role “Now, I’ve made it. I’m never going to not work again!” You have to learn that’s not true. Cozi as Hazel when her dad tells her Winter may be moved Courtesy of Warner Bros.
Kidzworld: How is working with Charlie Martin Smith as your director? He’s an actor too so that must help. Cozi: Yeah and on emotional scenes he doesn’t let the crew joke around you. He doesn’t let things get really loud. He brings you in at the last second possible before your scene, no rehearsal. He told me a story about when he was 17 and everyone was joking around and the lead actor went “Hey, everybody stop! This kid has to break down in a second. Stop joking! He said how much that meant to him so he does it for us. He’s very intuitive. 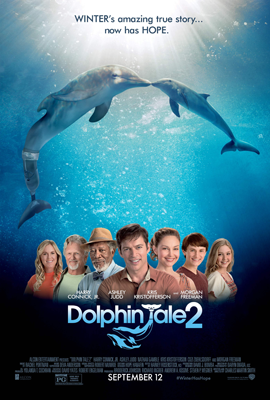 Dolphin Tale 2 Poster Courtesy of Warner Bros.